The global physical security services market is expected to be influenced by the swelling implementation of automobile tracking and other smart technologies and internet of things (IoT). However, a major chuck of the demand for physical security services could be driven by increasing terror attacks on humans as well as physical properties. Physical security is considered as a vital measure to protect against the surging incidences of terror attacks. Organizations of all sizes and across several regions of the globe are implementing security strategies at a rapid rate. Technological development in the industry and stringent government norms could be key factors enlarging the growth of the market. The global physical security services market is predicted to rise at a CAGR of 11.7% during the forecast period 2017–2022. By 2022, the market could draw a valuation of US$191.7 bn. In 2017, a valuation of US$110.3 bn was recorded by the market. According to the analysis of expert researchers, the world physical security services market is prognosticated to be segregated as per type and vertical segmentation. By type, the market could be classified into four key segments, viz. security system integration, remote monitoring services, access control as a service (ACaaS), and video surveillance as a service (VSaaS). Amongst these, ACaaS could post a dominating revenue of US$80.9 bn by the end of 2022. By vertical, the world physical security services market is envisioned to be divided into several segments such as banking, financial services, and insurance (BFSI), education, healthcare, government, manufacturing, retail, residential, transportation, utilities and energy, and commercial. Each segment analyzed in the report is studied in-depth in order to provide the best of information to buyers so that they become well-equipped to take important decisions in their individual businesses. On the basis of geography, the international physical security services market is prophesied to be segmented into five vital regions and one country, i.e. North America, Europe, Latin America, the Middle East and Africa (MEA), Asia Pacific except Japan (APEJ), and Japan. The analysts foretell the market of North America to top revenue share in 2017 and also 2022 while expanding at a 12.6% CAGR. The region could even become one of the most lucrative markets for physical security services over the course of the forecast timeframe. Japan and the MEA are forecasted to be among the slow-moving markets as they could lose 139 BPS and 59 BPS respectively in their share by the concluding forecast year. However, APEJ is anticipated to gain 225 BPS in its share by the same year. Europe could create an absolute revenue prospect of US$13.7 bn between 2017 and 2022. The publication presented herewith offers an exhaustive study of the vendor landscape of the worldwide physical security services market with crucial players profiled, including Tyco International Limited, The ADT Corp., SECOM Company Limited, STANLEY Convergent Security Solutions, Inc., and United Technologies Corporation. The global physical security services market is projected to invite handsome growth prospects on the back of an elevating adoption of monitoring technologies in both private and government sectors. However, vendors could face a challenge in the form of high initial investment required for physical security services. Nonetheless, the advent of universally popular sensors and other advanced equipment could create scores of opportunities in the market. The increasing need for unmanned guarding that reduces service cost is also expected to raise the demand for physical security services in the coming years. The global physical security services market could be classified as per type of service, vertical, and region. By service type, access control as a service (ACaaS) is forecast to account for a dominant share of US$80.9 bn by 2022. This report on the global physical security services offers a deep evaluation of some of the leading factors of growth and also those that could arrest the growth of industry players during the forecast period 2017-2022. The vendor landscape of the market has been critically studied for readers to gain a sound insight of current and future competitive situations. The world physical security services market is prognosticated to be positively impacted by the increasing adoption of internet of things (IoT) and deployment of smart technologies such as automobile tracking. However, rising terror attacks causing damage to human life as well as physical properties could be a major growth factor for the market. One of the ways the mounting occurrence of terrorist attacks could be effectively dealt with or avoided in the first place is considered to be the use of physical security services. Security strategies have been implemented at an aggressive pace in different regions of the world and across organizations of various sizes. Furthermore, tight government regulations and technological advancements could be counted among the critical factors supporting the growth of the world physical security services market. Worsening social insecurity and increasing crime rates are predicted to augment the need for physical security services in the coming years. Moreover, there is a sense of urgency to protect assets, employees, and critical official data in the business world, which could also improve the adoption of various physical security services in the near future. In the retail industry, physical security services could play a vital role in avoiding employee theft, shoplifting, and supply chain theft. The international physical security services market is foreseen to find profit-making opportunities in leading regions such as North America, which could rise at a CAGR of 12.6%. During the course of the forecast tenure, North America is prophesied to be reputed as a more lucrative region for physical security services business. However, there could be some markets such as Latin America which could exhibit a sluggish growth. For instance, Japan could lose 139 basis points (BPS) and the Middle East and Africa (MEA) 59 BPS by the end of 2022. 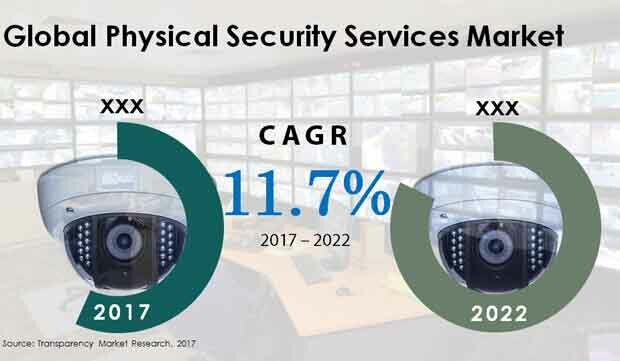 Nevertheless, the international physical security services market is envisioned to witness rewarding prospects birthing in Europe and Asia Pacific Excluding Japan (APEJ) with the latter expected to gain 225 BPS in the final forecast year. The worldwide physical security services market could include some of the top names in the industry such as SECOM Company Limited, Tyco International Limited, STANLEY Convergent Security Solutions, Inc., The ADT Corp., and United Technologies Corporation. New product launch is envisaged to be a significant business strategy adopted by key market players to enhance their product portfolio and push forward a better customer experience.